It is imperative in a one-daily newspaper town, that said paper get important facts correct. That is even more imperative when said paper was just awarded $3 million of taxpayer money by the Mayor of that town, for improvements to property it is currently trying to sell. Such is the situation with the Indianapolis Star. In an editorial in yesterday's paper and a front page story in today's issue, the Star takes on the topic of fixing Indy's roads and sidewalks. Neither time did the Star take the opportunity to mention that one side portrayed in the debate, Mayor Greg Ballard, just awarded them the $3 million taxpayer gift. Here are the facts that the Star apparently cannot grasp. There have been 3 proposals put on the table and 2 still to be introduced to the Council. 1) Last year the Mayor proposed the City undertake a $350 million project, dubbed Rebuild Indy 2. Most of the money was already on hand and would be supplemented with a $135 million, 30 year, bond issue. The bond issue alone was presented to the Council - not the remaining $215 million cost of the proposal being touted by Mayor Ballard. Now the wisdom of taking a 30 loan for at best a 20 year improvement is debatable. Never to my knowledge noted in the press was the circulation of a list of projects that neighborhoods were led to believe could be paid for if only RBI 2 was passed. Not true. The list was for twice as much money as RBI 2 would raise. Important questions never asked were : Why not go forward with the $215 million in projects for which the cash was already in hand? Why were you misleading the public with the list of projects? 2) After this year's severe winter, the spring pothole problem was far worse than usual. According to the Mayor's own estimates, the tab was an additional $24 million - yet he only requested $8 million. Unasked questions : Why only ask for a third of what you say you need? Why not clarify to the public that RBI 2 has nothing whatsoever to do with pothole repair? The $8 million proposal was passed by the Council after changes were made to ensure that every Council District saw some of the pothole money and repairs. 3) The Council Democrats put forth a proposal for the remaining $16 million that Mayor Ballard said was needed for pothole repair. This proposal passed the Council, as well. 4) The Mayor still has $215 million in cash on hand for street and sidewalk projects. But, he continues to hold that money and those projects hostage. He now proposes that the $215 million be supplemented with only $85 million bond to be repaid over 20 years. The same question still applies : Why don't you do the projects you already have the money to do, and work out the remaining funding piece later? This new version of RBI 2 is being paraded around to the press and the public in generalities only. Concrete details have not been released and the proposal has not yet been introduced to the Council. 5) The Council Democrats say they have a plan, to be introduced soon, that will fund street and sidewalk repairs and serve as a more fiscally responsible plan than either of the two versions of RBI 2 the Mayor has offered. No details have been provided. There is little doubt that street, sidewalks, and pothole repair are issues worthy of much coverage by local media. The public, however, deserves an accurate recitation of the facts and presentation of both sides' motivations. So far, Mayor Ballard's motivations have not been questioned, and they should have. And, so far, the fact checking by the IndyStar has not been nearly as robust as the reading public deserves. Over the last twenty years, much of the focus of City government has been on downtown. Of course, we also endured the Great Recession in the last ten years. So where were we and where are we? 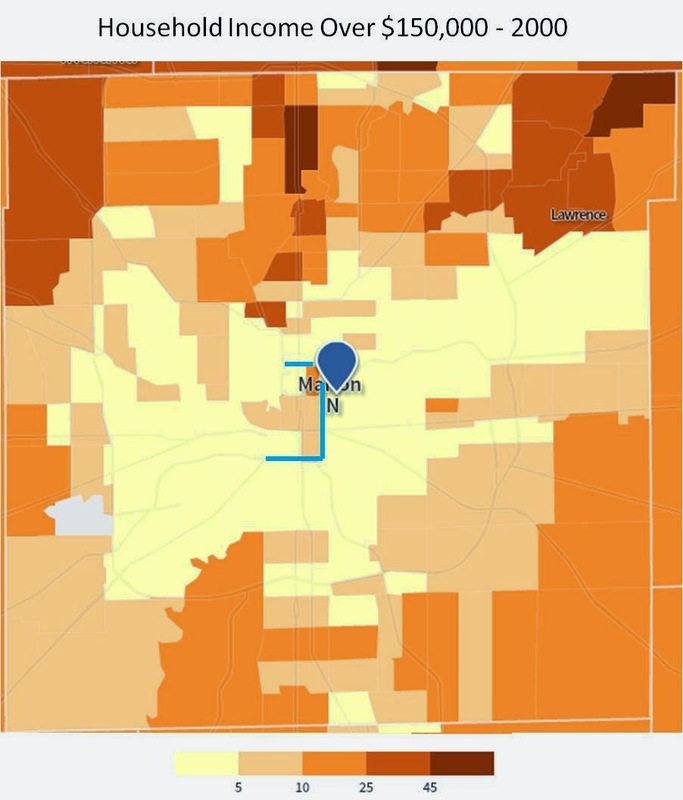 To get a better feel for things, I went to the Census Bureau's Census Explorer website and found some mapping functions that make the data kind of painless. I'll go ahead and apologize right now for the quality of the animations - its the best I can do with the programs I have. I also included crisper single versions of each map that appears in the animations. 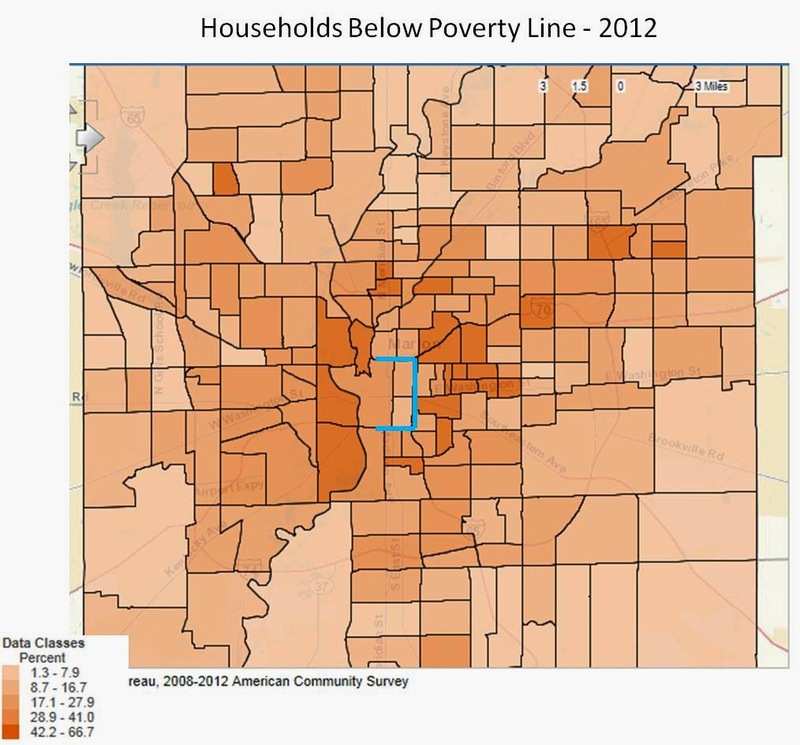 The maps illustrate the data from the level of census tracks. For each map, I added a blue line that shows three sides of the downtown mile square; I-70, the split, and I-65. So - let's start with median income. The data are from three Census years - 1990, 2000, and 2012. 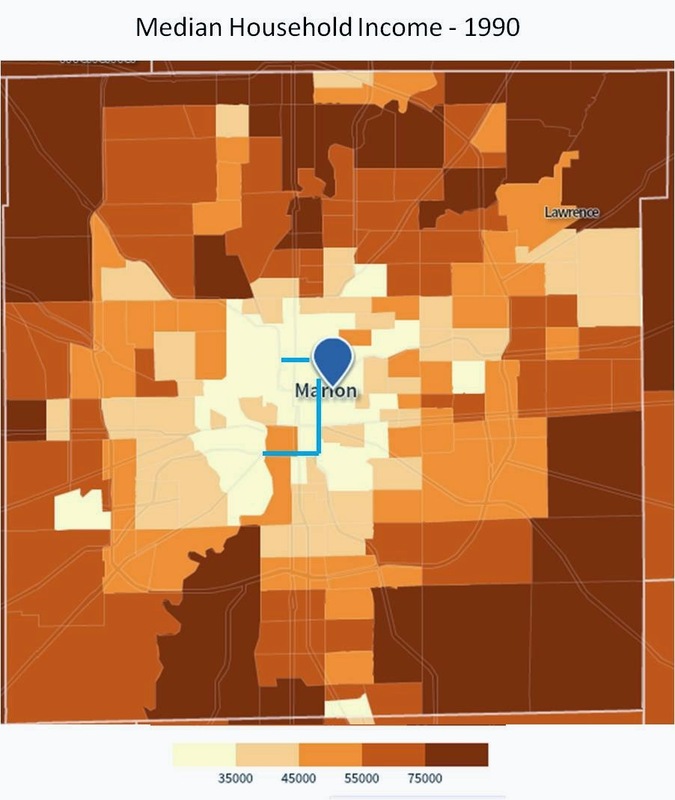 Animation of maps of Indianapolis-Marion County, Indiana, showing median household income by census track for 1990, 2000, and 2012. What can be seen is that median income increased between 1990 and 2000, but was served a huge setback by 2012 - pushing median income throughout most of Indy back by more than two decades. The mile square maintained its income base just fine through this time; after the infusion of hundreds of millions of public dollars. However, there is a lot more to Indy than downtown. Here are the individual maps with a greater definition - click on one to maximize. To get another view, I pulled the data for the percentage of households with incomes over $150,000 - the wealthy end of the income spectrum. Below is the animation of the maps, again from 1990, 2000, and 2012. 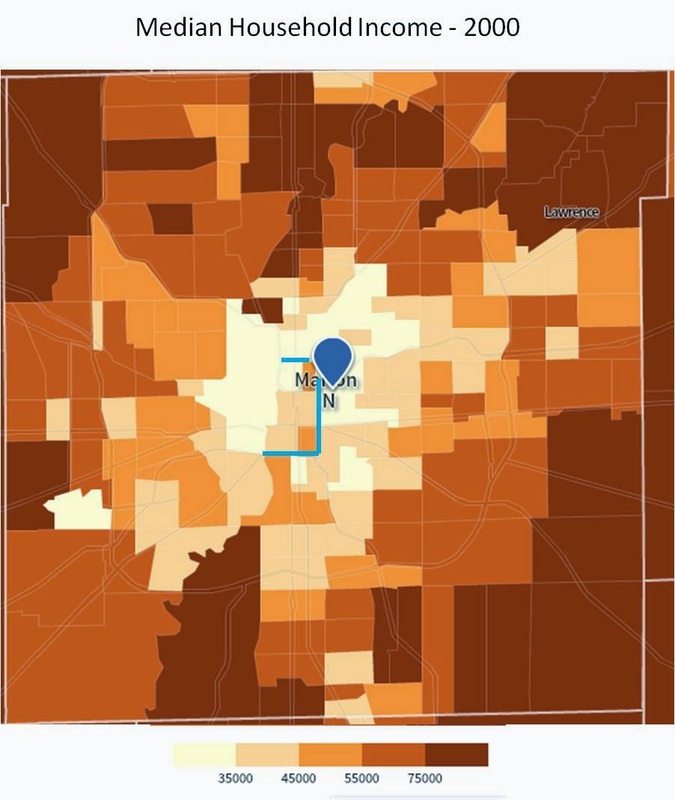 Animation of maps of Indianapolis-Marion County, Indiana, showing the percentage of households with incomes over $150,000 by census tract for 1990, 2000, and 2012. Looking at the trend for the wealthy, we see that the same pattern as before - things got better through the 90's, but were pretty tough through the 00's. However, between 2000 and 2012, downtown grew in the percentage of those with incomes over $150,000, unlike the rest of Marion County. 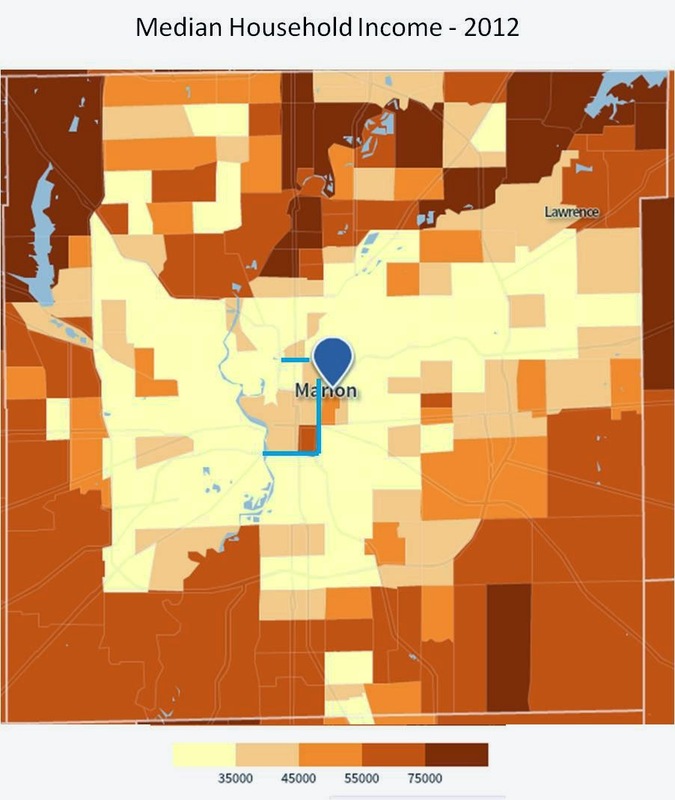 The broader maps, showing the donut Counties, have a similar pattern to the bulk of Marion County - suggesting it is not mainly a migration out of Marion County, but rather a lowering of actual income. Below are the three individual maps used in the animation. The Census website mapping for the percentage of households below the poverty level only allowed for census years 2009 and 2012 - so it is a very condensed timeline. 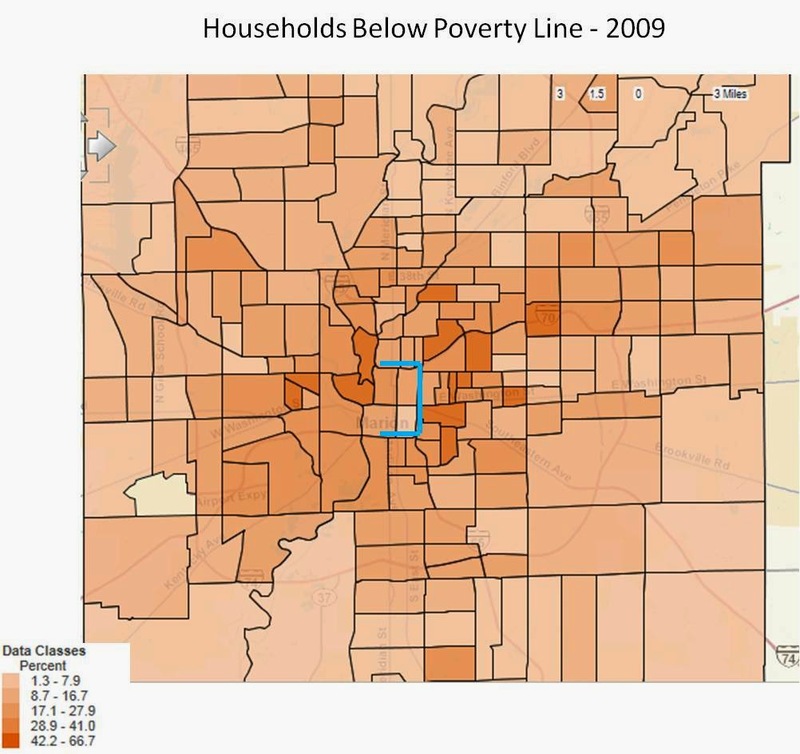 Animated maps of Indianapolis-Marion County, Indiana, showing the percentage of households with incomes below the poverty line by census tracts for 2009 and 2012. Between the two maps, we can see that things got worse for a lot of folks during those 3 years. The mile square was affected only slightly - but the ring around downtown, still inside Center Township, suffered great increases in poverty. All of the donut Townships saw increases in poverty, as well. Here are the two individual maps. With this limited information we cannot draw quality conclusions. The loss of median income could be from net migration in of the poor, a net migration out of the wealthy, a loss of wages across the board, or a shift to lower paying service jobs being offered in the 'new' downtown - or any combination of those factors. The shift to service sector jobs would have a more structural and permanent hold on Indianapolis than the alternatives. Regardless of the causes, which are important to figure out, we can certainly see much more clearly that the entire City needs attention, not just the downtown area. While the thought that you can't be the suburb of nothing has a ring of truth to it, it is equally true that a downtown requiring a substantial, ongoing infusion of cash from an ever weakening surrounding base cannot long endure either. Resolution 2014-B-002 goes to the MDC for a vote Wednesday. This resolution would float $5.5 Million in bonds as taxpayer investment in two projects - the "Pulliam Place" and "Millikan-On-Mass" projects. The Pulliam Place project will take about $3 M of the money. The agreement was worked out an unknown number of months ago, and has been wending its way through the MDC system - first being discussed at the Economic Development Committee meeting in early May, and then again by all of the Commissioners at their May 21 pre-meeting. The Ballard Administration gift of taxpayer money would be repaid by revenues of the Consolidated Downtown TIF. And what do you get for your gift? Some vaguely described improvements to N. Talbot, E. New York, and E. Vermont Streets, a dog park, and improvements of the existing Star building parking garage. And how does this benefit you, the taxpayer? Why the Pulliam Project is anticipated to create 49 new full-time jobs by mid-2017. There is no mention in the resolution of the average salary of those positions. And, there is no requirement that this number be reached. That works out to a taxpayer investment of over $61,000 per job. Of course the sales price of the Star building will rise concomitantly with the taxpayer gift. One would also expect the time to sale would shorten with this sweetener, as well. What also interests me is the last part of the resolution, where it states that the resolution to float the bonds will not be effective unless the Bond Bank "consents to and approves the adoption" of the resolution. Anyone who follows City government knows that the person who envisions these projects is the same person to negotiates the taxpayer terms of these projects and is the same person who runs the Bond Bank; one Deron Kintner. Why are they even pretending that there is any independent review of the taxpayer financing of these projects? The taxpayers who pay attention to such things, are familiar with the extravagant accumulation of TIF funds and equally extravagant expenditure of the same, all while elected officials, including Mayor Ballard, seek tax increases to pay for basic services. This one is different in that it calls into question the independence and integrity of the Indianapolis Star. In two days, the Metropolitan Development Commission will vote on a $3 Million bond to enrich the Indianapolis Star owners by improving the existing Star building, thereby increasing its sales price. Resolution 2014-B-002 bundles the "Pulliam Square" and the "Millikan-On-Mass" projects for a total of $5.5 Million in taxpayer dollars. The project has already been through the MDC's Economic Development Committee and has been discussed at its Pre-Meeting. The $3 Million gift from Mayor Greg Ballard to the Indianapolis Star has been in the works literally for months. When approached by the Ballard folks about the gift, the Star could have said, "No thank you. Such a handout would cloud the credibility we have built with our readers, and set up the perception of a conflict of interest." They also failed to alert readers of the many editorials and opinion pieces penned during these months, that supported Ballard or scolded those who did not agree with the Administration's policies, of Ballard's gift. The readers had an absolute right to know, and the Star had an absolute obligation to inform them, that they were awaiting $3 Million of taxpayer money. Each reader had the right to decide for themselves if Ballard's gift was irrelevant to a Star position, slanted an editorial stance, or outright bought and paid for the Star employee's praise. Each reader has the right to decide for themselves if this is an advance payment for another endorsement of candidate Greg Ballard in next year's run for re-election. The Indianapolis Star failed its readers. They also failed this fundamental test of its Journalistic Ethics.